Can I Talk to You for a Minute? : Just Don't!!! A little while ago when my Yahoo! homepage came up, the first story I saw was one about the controversial t-shirt that you see above. Now I won't lie, at first I wondered why there was even a story about this shirt because it looked kinda cute to me. Then I thought to myself that I would never seriously wear a shirt like that because I wouldn't wanna attract the wrong type of attention nor send out the wrong kinda message. Then once I read the article I really got offended. Plus it made me think back to another article that I read a while ago about how Nike was trying to put out some sort of "shackle" shoes and thankfully they'd been shelved. 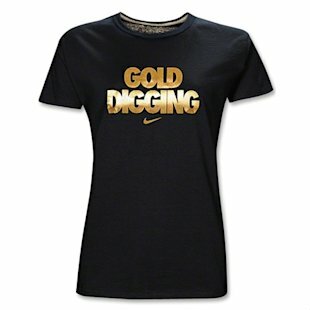 So what I read from the t-shirt article, Nike was the official outfitter for the London Olympics and they came up with this shirt that was only available for women. What makes this shirt offensive and inappropriate is that a "gold-digger" is a derogatory term for a woman who is out for a man's money. The article also went on to say that Nike could have come up with a better phrase to emblazon across this new t-shirt. I agree 100%!!! Like the article said, this implies that all those female gold award winners didn't deserve them and somehow did something underhanded to get theirs. NOT!!!! Sounds like Nike needs to lay off the paint fumes they've obviously been sniffing. All of that money that they've made over the years must have gone to their heads. Oh and just in case you didn't see these "shackle" shoes, here they go!!! I know crazy right!!!! I'm done!! !